In racing, all that matters is you, the car and the person in front. Get behind the wheel as DRIVECLUB revs its engines for a follow-up season of edge-of-your-seat racing. 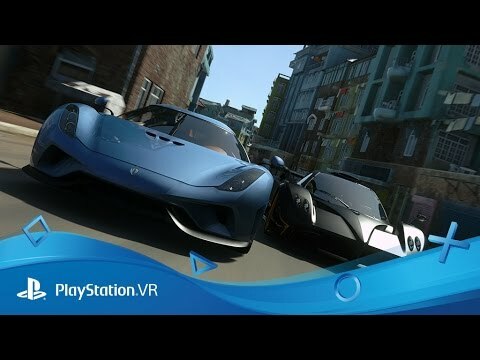 Combining the stunning graphical power and interconnectivity of PlayStation 4 with the unparalleled immersion of PlayStation VR, DRIVECLUB VR transports you to some of world’s most stunning locales in some of the world’s most powerful production cars. Experience Canada’s Fraser Valley or Japan’s serene Lake Shoji like never before, with a brand new suite of features including a “cruise control” mode that will let you take in the sights at your leisure and “Virtual Passenger” that will let you relive your best laps from the passenger seat. A new selection of urban tracks swells the total number to a staggering 114. Strap into one of 80 iconic high-performance cars to screech through corners, blaze along straights and fight the finish line as though you could reach out and touch it. Online servers for DRIVECLUB, DRIVECLUB VR and DRIVECLUB Bikes will shut down on 31st March 2020 (at 23.59 BST). All online features (including online multiplayer modes) will cease on that date. You will still be able to play and enjoy these games in single player offline modes. Own the DRIVECLUB Season Pass? Then you can upgrade with high octane discount on DRIVECLUB VR if you’ve purchased the Pass before 00:00 BST on 29/09/16. Don’t worry if you don’t own the Season Pass – you can still buy DRIVECLUB VR as a standalone game. Hi everyone! Following last month’s announcement about the impending arrival of Driveclub VR and seeing the great response from fans who managed to get hands-on at Gamescom, we didn’t want to keep you waiting around much longer for a release date. So – drum roll – we’re proud to announce that Driveclub VR will be […] The post Driveclub VR launches 13th October, with upgrade option for Season Pass owners appeared first on PlayStation.Blog.Europe. Hi everyone, my name is Duncan Smith and I’m Senior Music Supervisor here at PlayStation. I’ve been lucky enough to work on some great soundtracks in my time here, and I wanted to discuss my experience working on one of them – Driveclub. I also wanted to exclusively announce that there will be a Collector’s […] The post Driveclub Collector’s Edition vinyl soundtrack launches 30th September appeared first on PlayStation.Blog.Europe. While we normally like to keep everyone in the Driveclub community up to speed on any developments, we’ve had to keep this one under the hood…until now. So before Gamescom 2016 kicks-off tomorrow and you have the chance to get hands on with the game, we’re very proud to officially announce that Driveclub VR is […] The post Driveclub VR announced for PlayStation VR appeared first on PlayStation.Blog.Europe.